Few actresses were as capable of conveying their character's inner emotional turbulence as Joan Crawford and in 1947's Possessed, the consummate performer delivers the hurricane Katrina of almighty tempestuous thunderstorms. When we first see Crawford's severely distressed Louise Howell, she's wandering the streets of Los Angeles, practically catatonic except for her delusional cries of "David" when approaching some male strangers. After being taken by ambulance to a hospital, medicated and placed under psychiatric evaluation (ah, the good old days), Louise is able to approximate a story of past circumstances, including an obsessional dependency on another, that contributed to her present mentally disturbed state. Being a film noir we will, naturally, see these events in flashback form. Watching Louise becoming increasingly consumed and tormented by her amorous feelings toward an unresponsive David Sutton (a typical soul-searching performance by Van Heflin) makes for a deeply captivating experience. This is due to the subtle complexities of character and situation seamlessly interspersed throughout the narrative by writers Silvia Richards and Ranald MacDougall, from a story by Rita Weiman. 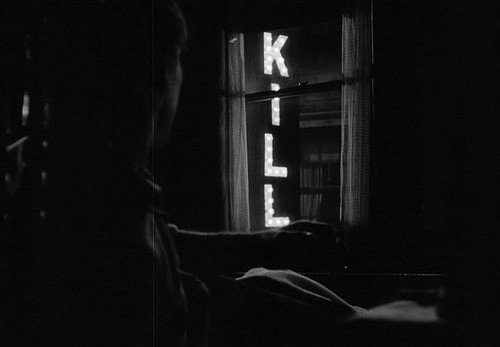 There's also the film's clever integration of noir elements as Crawford's Louise imagines herself culpable in the death of others, including David as a means of relieving her unrequited love's psychological suffering while simultaneously keeping him from being with anyone else... the latter of which will become a very real threat. Additionally enhancing this noir recipe are Franz Waxman's melodramatic infused score and Joseph A. Valentine's moody cinematography. These two artists harmoniously secure our deep involvement especially when capturing Louise's point of view. Marshalling this incredible array of talent is director Curtis Bernhartd, no stranger to exceptional film noir or even his main characters' obsessional desires as he showed in Conflict (1945) and would demonstrate again in High Wall (1947) amongst others. Horror fans will, of course, recognise the pronounced subject matter of fixated longing for someone else (the intended being one who cannot reciprocate those feelings) sensationalised in films such as Daddy's Gone A-Hunting (1969), Play Misty for Me (1971) and Fatal Attraction (1987). The results in films of this type may be more physically confrontational, immediate and therefore suspenseful but are less engaging and thought provoking than the far earlier produced Possessed. Even at her most schizophrenic heights, our heroine's sympathetic qualities shine through, enhanced by the film's underlying sense of invested compassion. The intricately developed and considered responses by Louise's surrounding characters increase the authenticity of Possessed without sacrificing the film's devotion to noir's exhilarating trademark of fatalism. Attentive viewers will be possessed (updated) Tuesday, November 13 at 9am PST. No less enveloping and released the same year as Possessed, is 1947's The Unsuspected, last month's TCM recommendation here and will unsuspectedly air again Monday, October 2 at 1pm PST. Concluding TCM's 1947 film noir triumvirate this week is perhaps the classification's finest, Out of the Past, previously praised here and arriving again on Thursday, October 5 at 3pm PST. 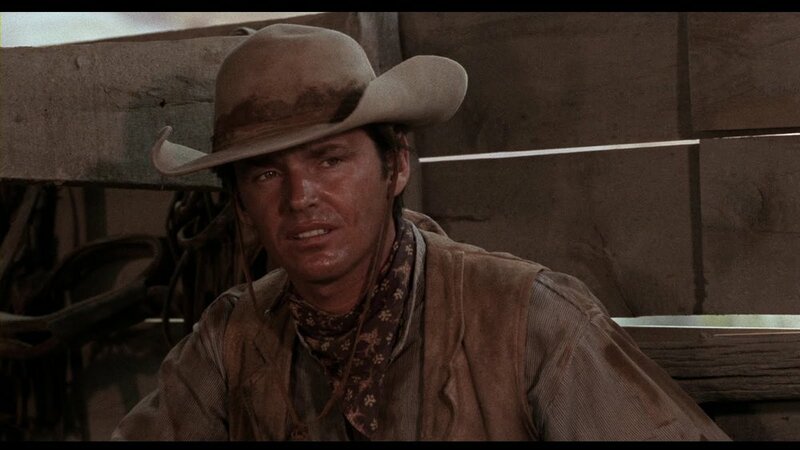 In the mid-60s, independent filmmaker Monte Hellman directed a couple of extremely low-budget but highly distinctive westerns made back to back, The Shooting and my next TCM recommendation Ride in the Whirlwind. The latter is best described as an existential, almost anti-western. The setting is non-traditionally stark but familiar. The events, however, are portrayed with little concern for rhyme or reason in a brutal and despairing manner. Although Ride in the Whirlwind has a more discernible plot and is not as abstract in nature compared to The Shooting, there is no "law and order” coming to the rescue here, nor for that matter does any representation of moral righteousness or justice exist. The "why" of things are made insignificant by way of the film's central three characters, cowhands who find themselves mistaken by a posse of death-dealing vigilantes for belonging to a greater gang of outlaws. There’s no time or place for heroic thoughts or deeds in these desperate circumstances, only how to best survive them. Virtue is only peripherally discussed amongst our trio of cowboys, and not as a means in itself of achieving a more rewarding life. Their moral choices seem guided only by what's suited to each individual's personality when they first unwittingly meet up with the stage robbing bandits. The three then decide to go on their way, ironic when they are misidentified as belonging to the gang anyway and doggedly pursued throughout the rest of the story. Later, when two of our three cattlemen hide out at a family’s homestead, their values become further challenged due to the harm they must inflict on others. Still, they are decisions which are accepted as "out of their hands" just as the unforeseen and dire circumstances they have found themselves in. One thing all of the characters have in common: No matter what happens, and even more so, what decisions they make, the results will be bleak, punishing and hard. Life itself is the “whirlwind" one must ride out all the way to the end. It’s a gale force that clears out all the remnants of romance and glory as it endlessly carries its survivors to their untenable destinies. In keeping with the modest budget and theme, dramatic contrivances are boldly absent in the brilliant original screenplay penned by the film’s star Jack Nicholson. This is a strikingly intelligent economical work, one that communicates a deep emotional empathy without condescending to its audience. Performances as secured by Hellman’s directorial prowess remain authentic throughout their characters’ trials and tribulations. Adding to the film's integrity is the recently departed actor Harry Dean Stanton, making a most welcome appearance. The overall exposition is made further harmonious by Robert Drasnin’s foreboding score and Gregory Sandor’s unobtrusive cinematography. Viewers will have that rare opportunity to ride this unusual and haunting western’s whirlwind (updated) Thursday, January 25 at 7:15am PST. Returning to films noir and specifically 1947 (the same year of release for the three previous noirs recommended above), we have Hidden Gem #10, They Won't Believe Me, with its fascinating, twisted plot and antithetically noir central character. This was my very first entry (linked here) for the Cinema Cafe Site with some kind words from the "Czar of Noir" himself, Eddie Muller, in the comments section below the review. If you're a TCM noir fan and haven't seen this unusual motion picture, please believe me, you don't want to miss this major opportunity. The next film to emerge from the shadows in Eddie's Noir Alley can be seen Sunday, October 8 at 7am PST and will repeat Monday, October 30 at (late evening) 1:45am PST. MGM's 1952 musical Singin' in the Rain was not adapted from a stage production, though the film was later turned into one, being first presented on stage in 1983. Its abundant creativity, innovation and driving energy place this film at the top of all cinematic musicals ever produced. Singin' in the Rain has been reviewed as a past Blu-ray selection here and will joyously dance its way onto TCM Monday, October 9 at 9:15 pm PST. Rarely does an atmosphere of such overpowering dread subsume a cinematic story so completely as it does in 1943's The Seventh Victim. A young woman (portrayed as a fetching innocent by Kim Hunter) goes searching for her missing sister (enigmatically played by Jean Brooks) in New York City's Greenwich Village and stumbles upon a satanic cult of devil worshipers putting both of their lives at risk. Mark Robson, who directed a number of these Val Lewton produced gems, is himself at the peak of his considerable creative powers. This devilishly striking combination of horror and film noir was a previous TCM recommendation and reviewed here. The fate of both sisters will be determined Tuesday, October 10 at 11pm PST. Here's a short clip, that eerily foreshadows the shower scene from Hitchcock's Psycho. Several months after a black-out, where all of a village's inhabitants simultaneously lay unconscious for several hours, those women capable of bearing children all become pregnant. Five months later, they give birth to ten-pound babies with blond hair, abnormally large heads, glowing eyes, and extreme intelligence. There is no definitive answer as to exactly how these peculiar children in this English town of Midwich are born, either in John Wyndham's 1957 novel The Midwich Cuckoos, or the hair-raising film it is based on, 1960's Village of the Damned. There is a clue, however, in the title of science fiction writer Wyndham's book: Cuckoos typically place their eggs in other nests for the surrogate parents to raise. In addition, the cuckoo chicks will often kill their "brethren" to acquire more food and parental attention. This suggests that these soon to become dangerously destructive children are in fact alien beings from another planet, although as previously stated, their exact origin, not to mention their exact purpose, is cleverly left open to our imagination. By adding these mystifying qualities, the filmmakers (Wolf Rilla expertly directing from an adapted screenplay by Rilla, Stirling Silliphant and George Barclay) deepen our thought processes regarding, for instance, their narrative's boldly insidious sexual implications. Additionally, the horror is increased when the children, emotionless and of a mind as one, develop, test and employ their other-worldly super-powers against their human hosts, as we contemplate just how far will they go. As the adults of the town become more and more desperate to curb their children's devastating behaviour, Village of the Damned proposes a microcosm whereby not only are the village's young ones condemned to hell, by responding so aggressively, we are as well. This is a low-budget "B" production to be sure, with minimally used and rather unimpressive special effects. The only recognisable name actor in sight is George Sanders (albeit the best choice for conveying a sophisticated, reasoned intelligence to combat the mentally superior kids) but don't let any of that deter you from being chilled to the marrow by this totally captivating film watching experience. “The Midwich Cuckoos” will hatch (updated) Saturday, March 16 at 10:45am PST. Later that same Friday morning is another cinematic tale of demonic possession but is it really the children this time, or their consumed Governess who are haunted by evil spirits? In 1961's The Innocents, similar to Friday's above selection, it is a question wisely left for the viewer to decide. This is a prior TCM recommendation here and will manifest Friday, October 13 at 10am PST and again on Tuesday, October 24 at 5pm PST. Director John Boorman has delivered with the precision of his film's title, Point Blank, a neo-noir masterpiece fortified with style and driven by purpose. Lee Marvin's 'cold as a frozen corpse' Walker, is a machine-like man on a mission, appearing unstoppable as he struts through LAX possessed with unbridled vengeance. It's also quite ironic that despite Walker's hardened resolve, the considerable threat he poses, generous amount of punishment he dishes out, and the high body count he seems responsible for, doesn't directly kill anyone in the entire picture. "Was it a dream?" You be the judge when Point Blank (first acclaimed here) hits hard Saturday, October 14 at 9am PST. From the same year as Point Blank, comes another violent assault on its audience previously reviewed here and is the story of Bonnie and Clyde (1967) only re-imagined as the mythical romantic exploits of an impossibly gorgeous but infamous couple in crime. The Barrow Gang will strike on TCM Monday, October 16 at 7:15pm PST. 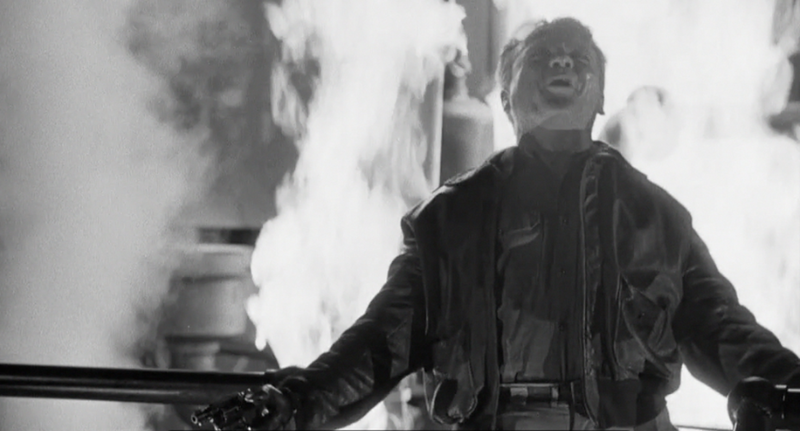 An actor use to playing gangsters, James Cagney, takes over noir territory in the appropriately titled White Heat, lauded here. The screen will heat up Wednesday, October 18 at 6:45am PST. The next TCM recommendation has been reviewed in Opening Up a Treasure: The Night of the Hunter. This highly expressionistic Grimm-like fable appears as if conveyed from a child's point of view. The hunter will appear Thursday, October 19 at 9pm PST. A true romance film of the highest artistic calibre has been reviewed in Opening Up a Treasure: Brief Encounter. Director David Lean's emotionally stirring encounter will begin on Saturday, October 21 at 5pm PST. From the U.K. we move to France for a more prolonged and agonising "encounter": the chilling Eyes Without a Face previously reviewed here. One can see with their own eyes this genre masterwork Sunday, October 22 at 11pm PST. My next TCM recommendation may have turned out less artistically accomplished than its creators intended. Still, it has many attributes making Doctor Zhivago well worth seeing. Afterwards, I'd be truly appreciative if readers had a look at my review here. This epic scale romance will begin Wednesday, October 25 at 5pm PST. We return to horror again for what was at the time (including throughout its primary creator’s career) the most audacious cinematic assault ever perpetrated on the movie going public or the Motion Picture Production Code for that matter. 1960's Psycho was previously reviewed here. The terror will begin Friday, October 27 at 5pm PST. The Lost Weekend, previously reviewed here, is Billy Wilder's portrayal of a writer's struggle with his addiction to alcohol. There's a powerhouse performance by Ray Milland at the film's centre as Don Birnam, whose desire (one of several) is to put his harrowing experiences down in the form of a novel: 'The Bottle'. Don's chosen literary title symbolises both extremes: his compulsive desire for poisonous ruin on the one hand and a personal salvation from, and containment of, those same formidable self-loathing actions on the other. Both types of "bottles" will be found on TCM Saturday, October 28 at 5pm PST. "Loneliness has followed me my whole life. Everywhere. In bars, in cars, sidewalks, stores, everywhere. There's no escape." These words come from the deteriorating and increasingly pressurised mind of a New York City insomniac in Martin Scorsese’s intoxicating Taxi Driver released in 1976. TCM will present this landmark film, previously reviewed as a Blu-ray recommendation here, Monday, October 30 at 11:45pm PST. Houses, particularly old dark ones haunted by evil spirits wreaking havoc on those foolish enough to take up residence, are practically a staple of the horror pantheon whether they be in books, films or real-life encounters. The inhabitants' terror is often so pronounced, even the most sceptical become consumed with thoughts of getting the hell out of there. Ghosts, poltergeists, such ungodly apparitions that might have spooked The Old Dark House, however, would flee from its residents faster than one could say "Harry Price". Welcome to the homeowners of The Old Dark House, the outrageously bizarre and frightening Femm's and their ghastly manservant Morgan. Horrifying and beyond dysfunctional than one could ever imagine, the Femm family is closely encountered by some unfortunate travellers caught in a thunderstorm one gloomy night. 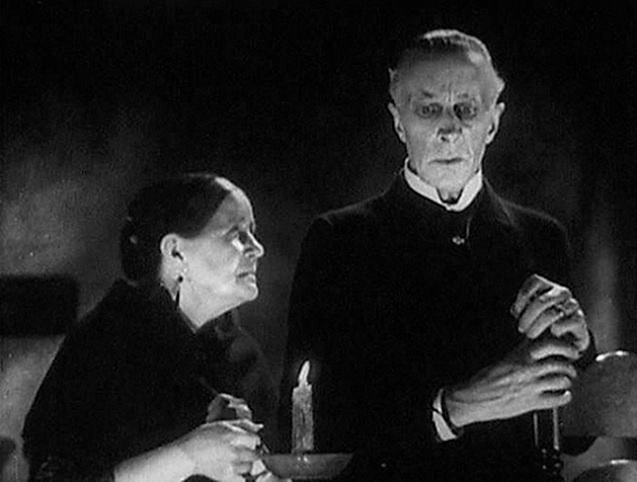 Director James (Frankenstein, The Invisible Man) Whale's masterful concoction of black-humour and treacherous behaviour results in some of most fiendish activities ever witnessed on film... no small feat, considering The Old Dark House was released in 1932! This brief but potent cinematic brew is perfect for Halloween and can be 'skulled' (updated) Wednesday, October 17 at 5pm PST. 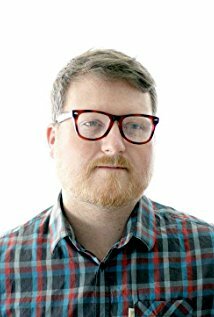 This month's Happy Birthday shout-out goes to non-fiction filmmaker Andrew James, who turns 39 on October 31st. James has already made quite a name for himself by co-directing and photographing the 2009 feature-length documentary Cleanflix (premiered at the esteemed Toronto International Film Festival) concerning self-appointed Mormon movie censors who re-edit Hollywood films without permission, and his latest endeavour, 2017's Street Fighting Men about three individuals trying to overcome their harsh reality in Detroit, Michigan. In addition to his own film productions, Andrew freelances on projects as an editor and cinematographer, as well as being employed as a professional teacher. 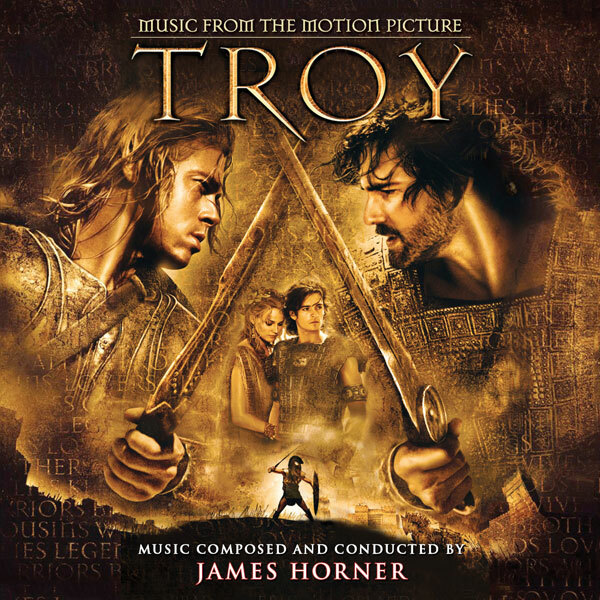 October's Soundtrack recommendation is Troy composed by James Horner. This newly produced 2 CD expanded edition produced by Intrada Records delivers Herculean orchestral might often heard during the film's impressive battle sequences as well as memorably heartfelt themes of subtle poignancy which frequent scenes of expressive emotional depth. Troy was, upon its release, perplexingly maligned by some critics whereas its epic qualities blend perfectly with a highly literate and respectful treatment by those involved in its making, none more so than the film's composer, the sadly departed James Horner. For detailed information on this limited release, including ordering from Intrada Records, simply click on the image. This month's Blu-ray selection is the above TCM recommendation The Old Dark House, a recent lovingly made 4k restoration presented by The Cohen Film Collection with some splendid extras to boot. Click on the image for more information on this Region A, North America package.